If you only had $100 to spend on a wireless AC gigabit router, what would you buy? Discussion in 'Wireless Buying Advice' started by Andrew LB, Sep 14, 2018. So i'm in desperate need of a new router. The one that is currently sitting on my desk is a Western Digital MyNet N900 ...... HEY! Stop laughing!... back to what i was saying. It's old, hasn't had a firmware update in half a decade, and it simply needs to go. I've got a PC and a Mac that are wired with gigabit as well as an amazon fire (soon to be upgraded). Another 4-5 smartphones, one of which is the not yet released iPhone XS that uses 802.11ac Wi‑Fi with 2x2 MIMO. I've also got a wireless printer/scanner, two smart TVs with wifi. My internet connection is Spectrum 200 megabit and my modem is an Arris SB6183. My house is 2 stories and approx 2100 sqft. I'm kinda leaning towards that Phicomm based on the testing on this site. 49 views and not a single suggestion? With these router you will never regret it and they are cheap. I will not recommend something that I would not use, remember always the cheap ends up costing expensive. Why exactly do you recommend those? Also, i'm wanting to buy a new or if i have to, a refurbished router. The Netgear R7800 costs $217 so it's not gonna happen. I just need a decent router with decent performance since i can't even login to my WD MyNet N900 because its security cert is causing both firefox and edge from connecting to it. I'll probably get an 802.11ax router once a gen or two of are released and bugs are ironed out. If you have to have new, get an rt-ac66u B1. It’s the same as an rt-ac68u. It's not going to take much to give you a decent upgrade. If you go for the Phicomm, realize they may not make it in the US market. So you'd be in a similar situation as with the WD. If you buy refurbished, I suggest buying direct from the manufacturer, or from Amazon Warehouse deals, so you won't have a hassle if you decide to return it. If you're going to try to support that many devices over two floors with decent throughput, you might consider spending more than $100. Just sayin'. Aside from the fact that it's an old N900 class routers, how well did the WD work for coverage and speed? I like these. I'm not a fan of used/refurbished. When I was researching some of my purchases I noticed a significant difference between new and used reviews. Sometimes you'll find great sales. I bought my brand new AC1900P for < $100. You don't say how well your current "relic" covers your house? If it does well then these should do the job. When I upgraded I saw some improvements but I didn't see any miracles. 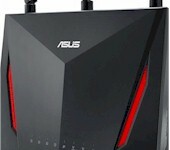 I prefer Asus for several reasons my favorite being their Real Time Traffic Monitor. It's my best friend when planning or troubleshooting. The former will be easier to setup and provide slightly higher AC bandwidth (on paper at least). The latter will give you a more solid routing and QoS platform, similar or almost as good AC wifi, and better swap-ability when the time comes for upgrades. Discrete components and an EdgeRouter would require intermediate or better skill to setup, though, so if that's off-putting, then I'd just default to an all-in-one. In either case, won't get the latest wifi standards or extreme throughput across covered range (R7800, etc. ), but you'll still get a good chunk of AC throughput to your clients, with WAN/LAN QoS of reasonable/good (all-in-one) or excellent (ER-X), either being your choice depending the path you pick. The Phicomm K3C @ $76 from Amazon.com is great value for money, considering you're getting an AC1900 class router with decent performance. Cannot recommend this one - yes, it's interesting because it's Intel - but it's also interesting as it's mainland china and the source is not open - interesting from a security perspective. With current events over on the mainland - even when I travel there - I leave my iphone and macbook air at home - I typically use a burner android phone over in Shenzen these days with a local SIM. 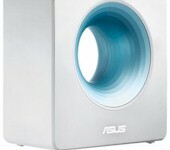 Asus RT-AC66U_B1 is the best all-in-one you can buy at that price. 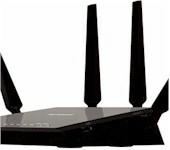 It has the most feature support of consumer standalone wireless routers at that price. It is based on a hardware revision of the highly popular RT-AC68U platform. It can even run Merlin firmware. It is available in every major region now, afaik. If for some reason you are desperate for a TP-Link or want an even cheaper device, then the TP-Link Archer A7/C7 (v5 revision) are also acceptable, very popular and widely reviewed. Going any cheaper with any other consumer all-in-one is a complete waste of money since it will perform worse, be more unreliable, or both. There is no point getting the more expensive TP-Link Archer C9. It will not perform any better than an A7/C7 in practice (likely the opposite). Note. older reviews of TP-Link routers can be almost worthless because they update hardware revisions so often for each model while retaining the same model name. The less said about D-Link routers, the better. Every once in a blue moon, they will come out with a router with an incredible price-performance that rivals high-end consumer routers, then promptly discontinue it shortly thereafter. Worse, many of their router models often suffer from much greater than average complaints about hardware reliability and failures, putting into question their quality assurance. So, you may get lucky with your D-Link router purchase device, but there could be as much as a 40% chance you won't. If you are in any way technical or are fed up with hit-and-miss of consumer router cycle, the best recommendation on general performance and reliability, is to get separate SOHO devices for routing and wireless. The Ubiquiti Edgerouter ER-X and either Ubiquiti UAP-AC-Lite or TP-Link EAP225v3 is such a combination and will be barely above your budget. 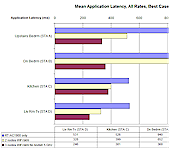 The latency performance, reliability and often even updates of such a combination is far better than any consumer router. 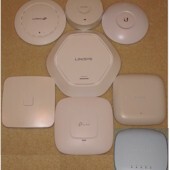 If you are in any way technical or are fed up with hit-and-miss of consumer router cycle, the best recommendation on general performance and reliability, is to get separate SOHO devices for routing and wireless. The Ubiquiti Edgerouter ER-X and [...] TP-Link EAP225v3 is such a combination and will be barely above your budget. The latency performance, reliability and often even updates of such a combination is far better than any consumer router. Can we just sticky this at the top of every SNB sub-forum? Well, you don't need a controller for Unifi since you can set it up once from a smartphone app or PC. Ubiquiti Unifi APs are also their most competitive product suite. In many cases, people want or come to realize they want multiple APs, in which case the strengths of Unifi's management system start to show. That's the reason I list it first over TP-Link, and of course, Ubiquiti have had more experience than TP-Link for these types of indoor SOHO APs. You know, I was able to buy a Netgear R7800 from some dude on Ebay selling a new one for $125. So sometimes a good deal can be had. I would check whatever model you're thinking of buying to see if the vendor is still shipping firmware updates (or if there's a good open source firmware available if you're so inclined). * probably wouldn't use much QoS or firewall features. But if you just want everything in your house to talk to the internet.... it worked great for that. The Dlink 878 or 882 seem like good budget options as well. And there's the ever popular T-Mobile refurbished TM1900 Cellspot version of the RT-68U, they go on sale for around $50.